I CANNOT believe it’s already April!! In a little over a month, I will be heading to Nags Head, NC to meet for a 2-day orientation with my NC2SD Bike & Build team, and from there we’ll starting our incredible 70-day journey!! So far, I’ve managed to raise 79% of my $4,500 fundraising goal. I have just under $1,000 left to fundraise before I can go on this trip!! Please donate if you can by clicking here!! This past weekend, I rode in the CNC Spring Ride in Edenton, NC, which was a 3-day cycling event. 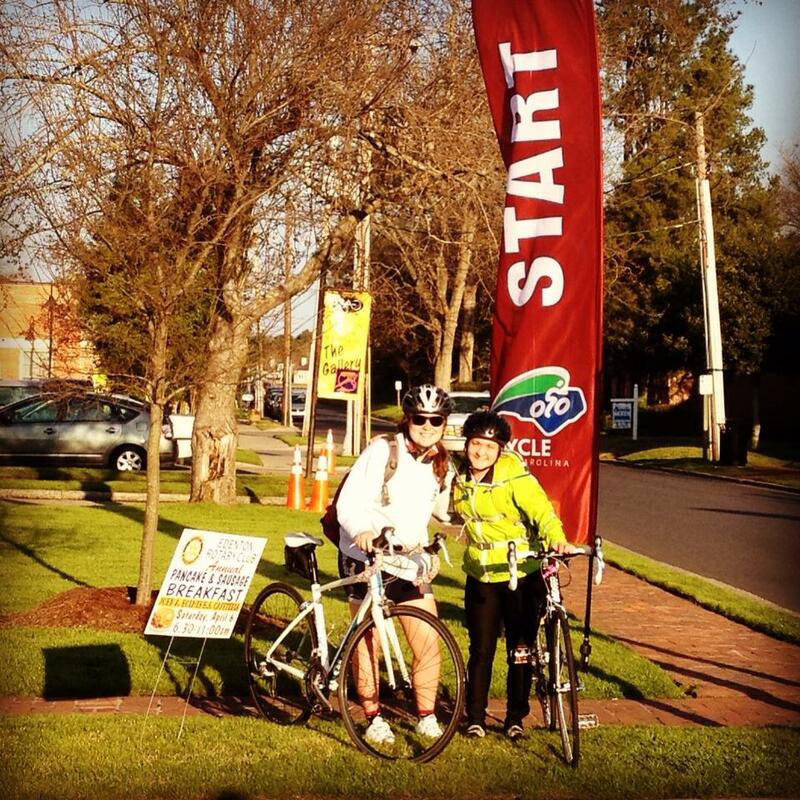 On Friday, my mom and I rode 60 miles! Then on Saturday, my new/great/awesome/HILARIOUS friend (and Bike & Build SUS’11 alumna) Jillian McMahon rode 110 miles with me!!!!! This is us at the starting line! Although my use of exclamation points may lead you to believe that we thoroughly enjoyed our ride on Saturday, the 15 mph headwinds didn’t really allow for too much enjoyment. Sure, it was fun being on our bikes and being outside in the sun, but fighting the wind for nearly the entire ride was actually pretty miserable. We started at 8am and did not make it to the finish line until 6:30pm! I was hoping to get my cycling tan off to a good start, but sadly the cold wing prevented me from taking off any of my layers. I wore cycling shorts, spandex pants, an under armor long sleeve shirt, a cycling jersey, arm warmers, cycling gloves, and a jacket for the ENTIRE 110 miles. On the bright side, we were only chased by one dog, who gave up the chase pretty quickly. My favorite parts of the ride included our brief cruise through a little neighborhood in Elizabeth City that was right on the water, and then that one time at around mile 70 where we caught some tailwind and rode that for, oh, maybe a few miles. My least favorite part, in case I wasn’t already clear, was the wind. I’m not really sure HOW we could have experienced headwinds the entire ride, given that we were essentially doing a big loop, but it happened… and it sucked. Overall, I’m EXTREMELY glad that we completed the whole 110 miles!! It’s more than I’ll have to do in a single day on my Bike & Build journey, and it has definitely helped to mentally prepare me for the days ahead. When I was feeling tired and sick of pedaling, I would try to talk myself through it. I kept telling myself “the ONLY thing you have to do today is ride your bicycle. That’s IT!” This simple thought changed my attitude from negative to positive several times that day. After all, I know that I am incredibly lucky to be able to bike at all. I have a healthy body, two legs that have been trained over the years to endure just about any physical challenge, and a go-big-or-go-home mentality. Bring on the 3,600 miles!!!!!! This entry was posted in Before my B&B summer! on April 10, 2013 by murphykg.